Students will be able to match the five senses with their corresponding body parts. Ask students to point to the body part they would use to taste an apple. Now ask students to point to the body part they would use to touch a dog. Tell students that today they will explore their five Senses: sight, touch, smell, taste, and hearing. Each of the senses has a related body part. Read aloud You Can't Smell a Flower With Your Ear!By Joanna Cole. Have students turn to a partner and share one detail they remember from the story. Call on students to share their details with the class. Tell students that our five senses help us to understand the world around us. 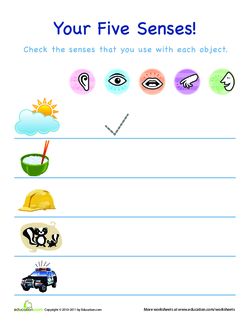 Tell students that they are going to explore how different body parts go with different senses. Ask, "Can you taste an apple with your eye?" Have students share their responses. Prompt them to answer why you can't taste an apple with your eye. Ask, "Can you smell a flower with you ear?" and "Can you hear a baby cry with your hand?" Ask students to share their responses and reasoning. Have students work independently to complete the two worksheets. As students work, circulate around the room to see how they are associating the senses with body parts and provide prompting as needed. Support Have students complete just one of the worksheets. EnrichmentHave students make senses posters where they draw things that can be tasted, touched, smelled, heard, and seen. Assess how students are matching the five sense with their associated body parts. 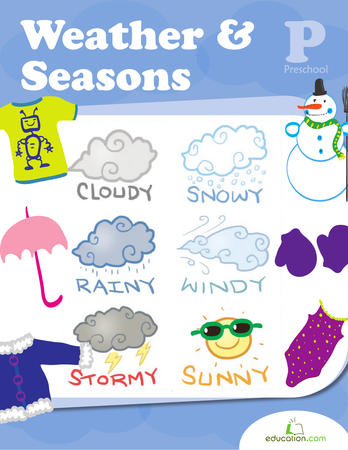 Our senses help us explore the world around us! 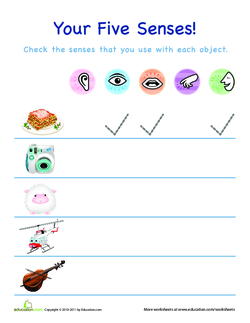 In this lesson, students tackle silly questions like "Can you taste with your eye?" and "Can you smell with your ear?"